A generous coating of dielectric grease should help to prevent corrosion on this Super Winch ground connection. What I'm not sure about is how to prevent dirt and mud from getting into the grease. Maybe a plastic barrier held on with a few layers of duct tape? If it's greasy, no tape or glue is going to stick. You only need the grease between the connector and the terminal. I would remove the connector, clean the area with solvent and seal the exposed metal with a spray-on zinc primer. Then bolt on the connector, with just a thin coating of grease applied to the contact surface. (It should still have a good connection through the zinc primer.) Paint or spray the metal and the connector with a suitable epoxy or polyurathane paint, or an underbody sealant to keep corrosion at bay. I would put the compound under the connection and over the connection and leave it at that. The connection is only as good as the other end of the frame where the negative from the battery makes connection. I'm sure you will find a bare connection without any grease compound. Oops---- When I said put the grease under the connection I meant using NO-OX-ID or similar compound designed to prevent corrosion on and between electrical connections. Dielectric grease will not conduct electricity. Sorry for the incorrect advice. I have used NO-OX-ID on aluminum and battery connections, but I have never used dielectric grease. We clearly should have done some more research before going to the store. Oh well --- live and learn! Thanks again for all of the awesome data! Mark, I've used dielectric grease before and it does attract dirt, but it seems to help anyway. 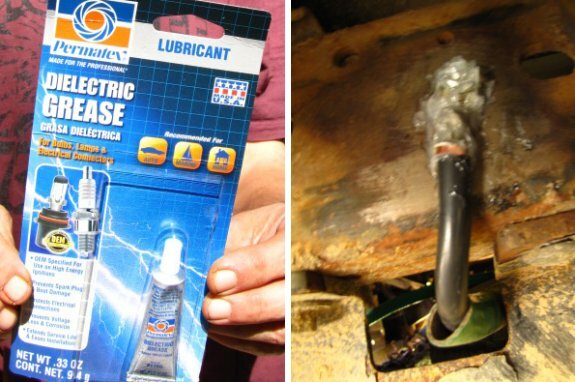 I never tried it for a ground connection, but I wonder if the protective spray for truck battery terminals might be a good option. I think the can I have in the shop is permatex brand. Justin-I was concerned about dirt getting into the grease and then falling off with gravity. The plastic barrier should prevent that if it stays in place.